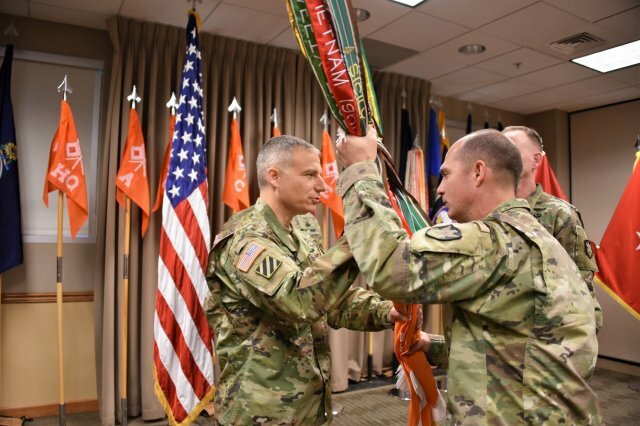 A US Army change of command is ceremoniously symbolized by the transfer of the unit guidon, organizational flag or organizational color from the outgoing to the incoming commander. Here the incoming commander of the 53rd Signal Battalion, 1st Space Brigade receives the organizational color from the brigade commander. In the background can be seen the company guidons of the battalion. The branch colors of the Signal Corps, orange and white, figure in the design of the battalion's colr and guidons. Also present is the National Color and, though not clearly visible in this photograph, the Army Ceremonial Flag and the Organizational Flag of the 1st Space Brigade. Battle of the Java Sea Remembrance Liberation of Dachau • April 29, 1945 "Don't Give Up the Ship!"